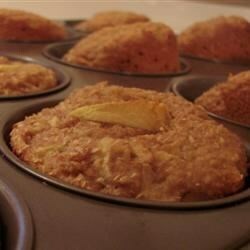 "Tasty and fast apple muffins. They are great for a breakfast treat!" Preheat oven to 375 degrees F (190 degrees C). Grease muffin tins. In a mixing bowl, combine bran flakes, flour, brown sugar, cinnamon and baking powder. Stir in apple juice, margarine, vanilla, and apple. Spoon the mixture into the greased muffin tins. This comment is for PAM62; of course this recipe does not have eggs in it, it is a VEGAN recipe. That means the strictes type of vegetarians that do not eat: meat, eggs or dairy. This is the recipe that needs eggs. Even though they tasted great they came out looking like hockey pucks! There is nothing in this recipe that makes the muffins cakey or rise. I really like these muffins! Mine came out moist, flavorful and not at all like hockey pucks. I'll enjoy playing around with the recipe and trying variations. This is probably the worst recipe I have ever made. I thought it was odd that there weren't any eggs in it, and the end result proved it needed them. How can I give this a "0 star" rating? No flavor. Don't see how anyone could rate this so highly. Only thing good was the raisins I added. These muffins were pretty good for low fat - but they didn't have much taste. You may need to spread some jelly or butter on them. Great muffin! Very moist. I will make these again!